Just 14 days ago, the clock struck 12, and time starting tick, tick, ticking away the new year. That’s 12 months or 52 weeks or 365 days or 8,760 hours of life ahead, as God allows. The possibilities get me giddy, which is why I always sketch out some goals and dreams. Now, stats show that if you made any new year’s resolutions, 36% of them have already been broken, which is rather discouraging. Looking at it from the flip-side means 64% of those resolutions are still going strong. And that’s pretty good, considering some psychology experts say January is the worst month to attempt life change because “you’re recovering from holidays, you’ve got work to catch up on, it’s really cold, people are miserable.” Humorous, and likely true. I’m just now pulling my goals and dreams together, so technically, I haven’t broken my resolutions (yet). But since I’m looking for progress, not perfection, I’m OK with that. Despite the way life tossed me about in 2017, each moment of it was beckoning me to seek God, and perhaps feel my way toward Him and find Him, because He is actually not far from me. Any moment of disconnect from God is an opportunity for me to seek for Him, feel my way toward Him, and find Him. And He makes it easy for me because He stations Himself nearby, not far. What consolation! 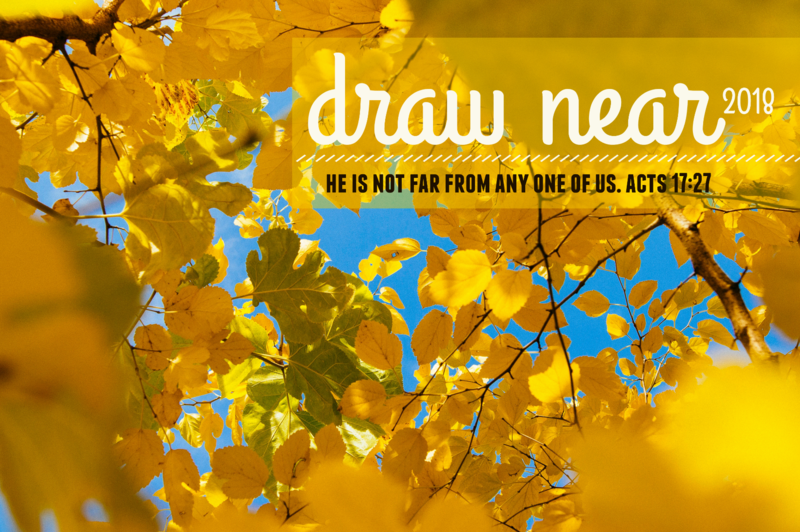 Since God is not far off, I want to draw near to Him in the days ahead. And so these are the hopes and dreams I have outlined for 2018, each of them designed with that end goal in mind, that I might live and move and have my being in this God who has come near in Christ Jesus. Drawing near to God includes keeping a daily time I call feast & worship—where I get nourished by Jesus, the Bread of Life, and I give God the praise He’s due—part of that is finding some new worship music (send me your recommendations!). I’d also like tend my soul by reading through the whole Bible, finishing a Romans study, and taking a monthly mini retreat as well as my annual beach retreat. Small joys remind me of God’s nearness and willingness to delight His children, which is why I’m continuing my coffee-a-month again in 2018. I’d also like to order a photo book for 2017 so I can see the beloved faces of my people. And my heart finds much life when I’m reading regularly, so I’d like to read at least 30 minutes each evening, which really shouldn’t be too hard for me! I’ve found that having an active mind makes me more aware of God’s nearness and His common grace, which is why I want to take in cultural artifacts and consider new ideas. I’d like to go to a movie a month with Mike, read at least 40 books, and create a specific plan each month to keep my on track with these 2018 goals. Being connected to my physical body is something I’ve been pondering in the past few months; I’m attempting to be aware of this vessel and how God meets me right here, in the flesh. Because my work is mostly sedentary, I’ve often gone hours on end without leaving my desk. So I’ve found an app that will send me movement alerts to get me out of my chair more regularly. Last year I needed to lose some extra weight I’d gained—which I did, but then I found a few of them again. So I have set a few running goals that will require some consistency I’ve been lacking. I’ve set some monthly strength training and core workout goals, and to help, I need to print some workout sheets I found online. One of my favorite things from 2017 was the birth of Saturday coffee time with Mike—we are both quite happy to continue that in 2018. I also have plans for regular time with my favorite people, whether that’s via coffee dates, a text check-in, or set times for catching up. One new goal is making note of the special ways my people specifically encourage me and display kindness to others and then spur me on in my faith without even knowing it. My daily (paid) work life is a wonderful patchwork of client work in which I provide marketing strategy & consultation and editing & proofreading services. New for spring is teaching a nonprofit communications class at Moody Bible Institute on Wednesdays. This mishmash means that my income is rather unpredictable, but I’ve set a monthly billing target anyhow, hoping to keep myself focused and dedicated to doing what needs doing. (ahem.) Also new this year is outlining specific vacation days. Last year I realized I was scheduling myself out of work with one client to make room for other work (either paid or unpaid), which meant it was rare I had true time off work. I have already blocked true vacation days on my calendar and can’t wait to take them! Finally, the increase in workload means that I’m thinking intensely right up to end of day. And then, when I emerge from my basement office, I’m still in work mode, which affects dinner. I plan to devise an EOD transition routine to close out of work-thinking and move into rest-of-life-thinking. Send along any ideas you might have on this one! If 2016 was Comfort Detox manuscript writing and editing madness, 2017 was the exact opposite. I hardly wrote much at all, and my heart is craving the creative outlet. To get my creativity rolling again, I’d like to develop a Comfort Detox Lent series (and I just found out Lent starts February 14, which is a bit unsettling! ), outline an idea I have for a potential book, schedule and keep a weekly writing block (the slot I tried in 2017 did not work, sadly), and put weekly creative effort into planning, promoting, and supporting the Persuasion podcast I host with Hannah Anderson. One place I’ve been quite disconnected from is the care and keeping of my home. Much of that relates to having too much work and too little home time in 2017. To remedy that, I’ve scheduled three staycations this year, each just a few days, during which I want to clear out closets, organize papers, and purge the excess. I am so very excited about this!